A man returns to his childhood home, which he recently inherited from his aunt, to finish his novel. Once there, he is haunted by demons from the past and may have the opportunity to correct a past mistake. 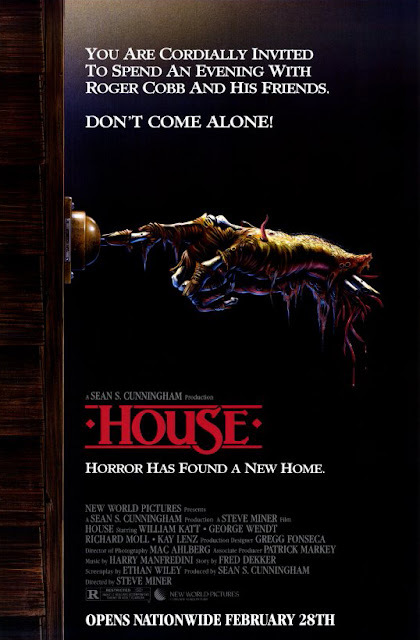 "House" has it all: a Vietnam veteran suffering from PTSD, a house haunted by odd-looking demons, and 80's-style plunging v-neck sweaters. What more could you want from a horror film? 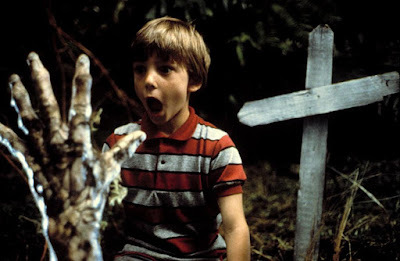 This picture is directed by Steve Miner, who is known for directing such scary movies as "Friday the 13th Part 2," "Friday the 13th Part 3," "Warlock," and "Halloween H20." The story is written by Fred Dekker, who has written movies like "Night of the Creeps," "The Monster Squad" and the 2018 film "The Predator." The screenplay is written by Ethan Wiley, whose writing credits aren't nearly as noteworthy. 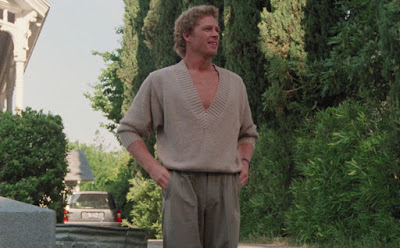 The film stars William Katt as writer Roger Cobb, who has recently inherited his childhood home from his aunt, who committed suicide. Cobb has decided to return to this home to finish writing his latest book, which is all about the time he spent serving in Vietnam. Once he arrives, Roger is haunted by demons from the past, as well as literal demons. He is conflicted about the mistakes he made while fighting in the war, and is tormented about when his son vanished without a trace. 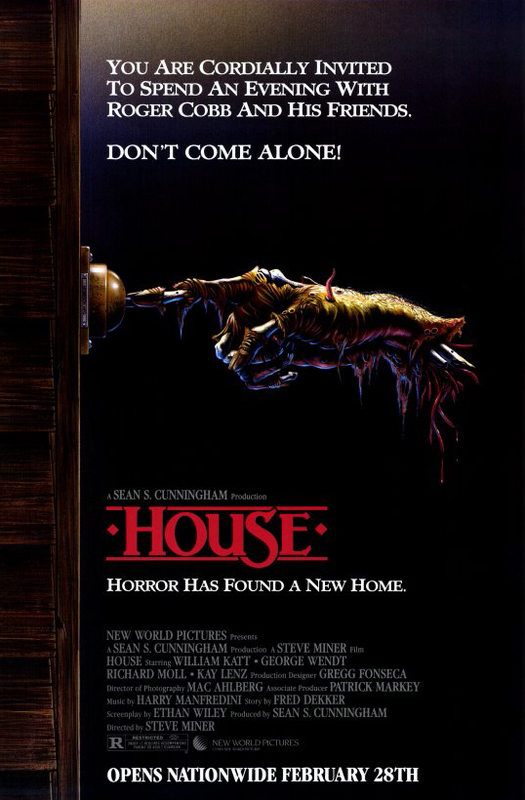 It may not sound like it based on the hefty description above, but "House" is a tongue-in-cheek horror movie. It isn't a complete comedy, but it isn't entirely serious either. It has that same style of dark horror comedy that you'd find in films like "Re-Animator" and "Return of the Living Dead," which came out the same year. One may even compare it to "Evil Dead 2," which came out a couple of years after it. Like those films, "House" has some impressive, well-done creature makeups. 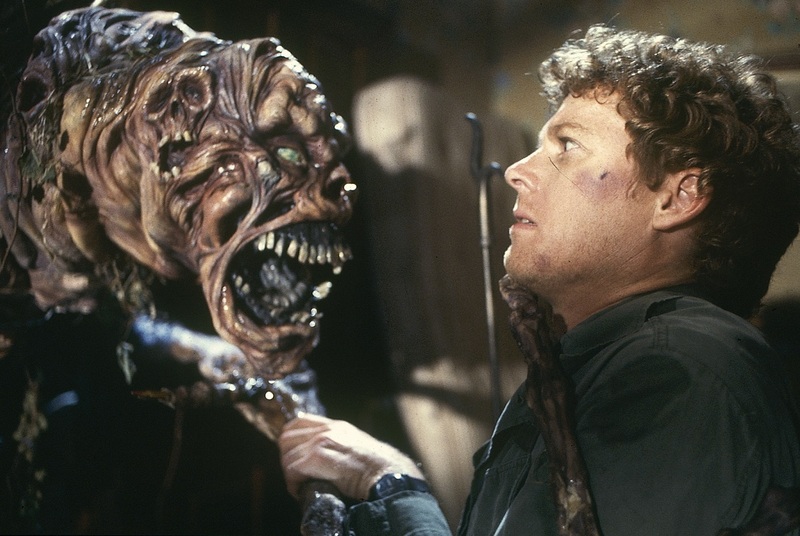 There is also excellent stop-motion animation implemented on one of the creatures that torment Cobb from an alternate dimension. We just wish the demons mouths would have looked better as they are talking to Cobb. They look kind of cheesy in their present state. The story itself is sort of all over the place and doesn't have the most well thought out narrative. It's more like a random series of happenings that lead to something that doesn't make a whole heck of a lot of sense. Nothing is crystal clear until the last few minutes of the film. That being said, "House" still manages to be wholly entertaining in all its bizarreness. Along with battling otherworldly demons, Cobb must also "battle" his very friendly but slightly nosy neighbor Harold (George Wendt), who keeps popping up thinking Cobb is acting like a lunatic. Any time Wendt is on the screen, it creates some funny and silly situations that made us laugh quite a bit. While "House" isn't the scariest movie in the world, it's also not trying to be. It may not have the most perfectly written story, but it still provided us with a good time nonetheless.